Franklin Dermatology offers aesthetic services to keep your skin healthy and beautiful. Contact us for a free consultation to learn how we can help improve your skin's health, beautify, and then maintain the health and appearance of your skin. 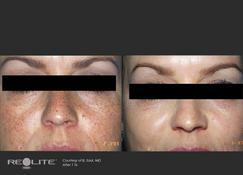 As the skin ages and the sun wreaks its havoc, lines and wrinkles appear, and age spots surface. If you've begun to notice surface wrinkles, texture changes, and sun damage on your face, neck, or hands, you're probably wondering what can be done about them. Target these imperfections with the latest technology offered at Franklin Dermatology. RevLite® is a non-ablative laser that uses PhotoAcoustic Technology energy to stimulate collagen, reduce pore size, plus diminish wrinkles and acne scars. Quick full-face treatment options with no downtime and minimal discomfort allow you to return immediately to your daily activities. Discover how this revolutionary laser skin rejuvenation system can help you turn back the hands of time. Call Franklin Dermatology at (317) 736-0040 and start looking and feeling younger today! Tattoo removal once meant gambling low odds of success on a high risk of scarring and pain. New advances in laser technology enable tattoo reversal to become a permanent decision. Our tattoo removal laser, RevLite®, features 4 wavelengths to target a wide range of colors, even difficult-to-treat green and sky blue. 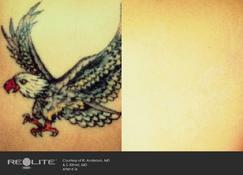 As the tattoo is treated, laser energy gently vibrates and shatters the tattoo ink into microparticles. Over time, the tattoo will gradually fade by elimination of the ink microparticles through the lymphatic system, and the skin will return to its natural color. 5-15 treatments are typically necessary to achieve tattoo clearance. Do you have a tattoo that you wish you never got? Don't live with regret! Call Franklin Dermatology today at (317)736-0040 to schedule a free consultation to learn how we can help you. Pulsed light systems work by emitting pulses of intense lamp-light into the hair follicles. The light is absorbed by the pigment in the follicles and converted to heat . The heat loosens the hair and disables the cells responsible for growing new hair. This technology works for darkly-pigmented hair only. © 2018 Deborah J Armstrong, MD PC dba Franklin Dermatology. All Rights Reserved.